Top of the table Castleford Tigers are gearing up for a tough test against Huddersfield Giants this Friday, according to first team star Junior Moors. Although the Giants stand third from bottom and five points behind Castleford and come into the game at the Mend-A-Hose Jungle off the back of a couple of defeats, they are not being underestimated. “Huddersfield are a good side,” said Moors. “They’ve caused us trouble the last couple of years we’ve played them while I’ve been here so we expect nothing less. “We’ll go in there ready for a big game and hopefully we’ll come away with a win. “They’ve good some players all round the park that can hurt you if you are not on your game. 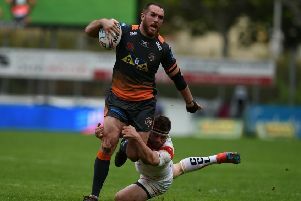 Castleford go into the game top of the table following their quick return to winning ways against Catalans after suffering their first defeat of the season at Salford the previous week. Moors added: “It was massive for us after losing last week when everyone was disappointed. “There’s a few things we need to fix up going into Friday and we’ll be working hard. More from Junior Moors in Thursday’s edition of the Pontefract & Castleford Express.